Announced 4/18/2018, all Carson Pirie Scott stores will be closing. If you owned a Carson’s Rewards Credit Card, that card will be closed and cancelled on 06/26/2018. 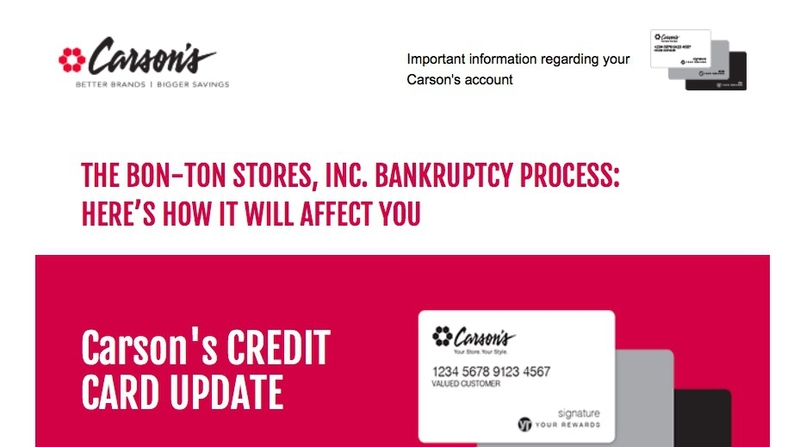 In an email sent out from Carson’s Comenity Bank, it details important dates to note about the closing and bankruptcy of Bon-Ton Stores Inc., which owns Carson’s. 04/19/2018 – Your Carson’s rewards credit card will no longer be accepted as a form of payment and rewards, benefits, or other offers issued will no longer be accepted. 06/26/2018 – Your Carson’s rewards credit card will be closed. Find the email notice that was sent out to rewards credit card holders below. Thank you for being a loyal Carson's card member. We regret to inform you that the YOUR REWARDS credit card program will be discontinued immediately due to The Bon-Ton Stores, Inc. bankruptcy proceedings. Please see below for important information regarding YOUR REWARDS credit card account. subsequently be closed on 6/26/2018. other offers issued will no longer be accepted as of 4/19/2018. destroying all YOUR REWARDS credit cards issued to your account. to pay your bill online, by mail, or by phone. If you have a balance on your account, you will continue receiving billing statements until the balance is paid in full as stated in your Credit Card Agreement. The terms and conditions of your account continue to apply until the balance is paid in full. how do I negotiate the interest down also. I bought a piece of furniture before the announcement and it's not covered under warranty even though it's defective!!! They still expect payment!!! I'm beyond angry! I would like to know the answer to each of these questions! Since Carson's is no longer in business, WHO THE HECK DO I PAY? AND HOW DO I NEGOITATE MY INTEREST RATE DOWN? Since Carson's is no longer in business, WHO THE HECK DO I PAY? AND HOW DO I NEGOITATE MY INTEREST RATE DOWN? This is insane, I too have a $100 gift card my elderly parents gifted me. This is unacceptable!!!! They deserve a refund at the very least!!!! I have a gift card they are no longer accepting. I am not happy about this. I have been a loyal customer for over 50 years...How can get reimbursed for the value of my gift card?